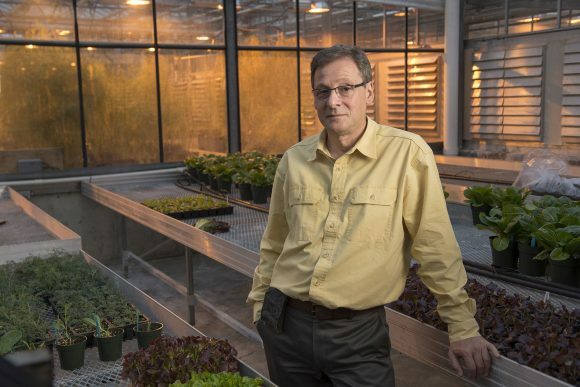 Share the post "Prof. Ilya Raskin and Collaborators Awarded Global Health Grant to Help Seed Expanded Research in Indonesia"
Distinguished Professor of Plant Biology Ilya Raskin in the Cook campus greenhouse. The Rutgers Global Health Institute, with support from Rutgers Global, awards Global Health Seed grants to faculty conducting collaborative, interdisciplinary activities that will impact the health of communities at home and around the world. In April, Ilya Raskin, distinguished professor in the Department of Plant Biology, along with collaborative partners at Rutgers School of Arts and Sciences and Universitas Nasional, was awarded a seed grant of $10,000 for implementation of the project, “Discovering Antimicrobials from Nature: Education and Capacity Building in Indonesia,” which is scheduled to begin in July 2018. For the past 15 years, Rutgers scientists have developed and extensively tested Screens-to-Nature (STN) technology that relies on very low-cost, field-deployable assays to effectively detect pharmacologically active compounds in plants and other natural sources. By transferring this technology to scientists and students from Universitas Nasional and Universitas Palangka Raya, two leading Indonesian universities already collaborating with Rutgers, the goal is to facilitate the discovery of natural antimicrobials in a biodiversity-rich yet poorly explored region of the world. This Global Health seed grant will be used to conduct an STN training workshop at the Rutgers-operated Tuanan Orangutan Research Station in Central Kalimantan, Indonesia, and establish sustainable STN-based research at this location. In addition, the grant will help provide research training and capacity building for local communities and universities, and develop opportunities for significant international funding. The broader goal of this project is to lay the foundation for a long-term collaboration between Rutgers faculty and Indonesia in the area of naturally derived products and human health.